I think it's so fun to involve kids or grandkids (if you have them) in holiday decorating and craftiness. My daughters made these over the weekend. The base is a piece of cardstock rolled into a cone and taped. Then they covered them with some scraps of felt and polar fleece I had around. You could really use any scrap of fabric you have on hand. Or if you don't have fabric, scrapbook paper or colored cardstock would work fine. 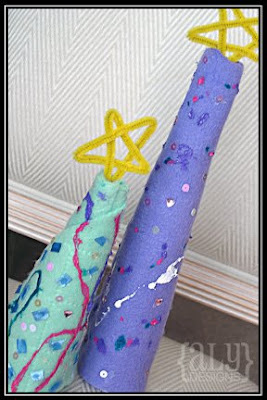 My girls decorated the trees with puffy paints, sequins, bling, cut up pieces of ribbons, and the stars are chenille stems. I did have to help them cut the bottoms so they were flat, but they did all the rest.